Hatching in AutoCAD is a way of filling in areas of your drawing with a pattern that represents certain materials. It is usually used in sectional views. Starting with AutoCAD release 14, you can use a solid fill to completely fill in areas such as walls in a floor plan. Boundary Boundary / BO Home > Draw > Boundary Creates a polyline or region from enclosed area. Draw a rectangle 10 by 10 and put a circle with 2 radius in the middle of it (remember the M2P OSnap?). Start the Hatch command by typing H <ENTER> . When you start the command, you will see a prompt on the command line (shown below). Press T <ENTER> to select the settings option to get the dialog box for the hatch and gradient settings. As usual, start at the top of the dialog box and work your way down. We're going to say that this is a cross section of piece of steel with a hole drilled in it, so choose the predefined Hatch pattern called STEEL. Now you want to pick the area to be hatched. Pick somewhere inside the rectangle, but outside of the circle and press <ENTER>. Set the scale of the hatch to 6. This is a number that works for this sized object. A larger number will make the spacing between the hatch lines bigger (maybe so big you won't see it) and a smaller number can make the hatch so dense that it looks solid (try different numbers later to see if I'm wrong). Make this "Associative" - this means that if you adjust the rectangle or circle, the hatch will automatically correct itself to the new boundary. Finally, hit the Preview button to see if this is what you are after, it should match the image below. Note that AutoCAD recognized the circle in the middle and didn't hatch over it. If the lines appear 'jagged', don't worry - it is a video display issue - the prints will come out clean and straight. If you want to edit the hatch, the easiest way is to just double-click on it. This will bring up the Properties pallet. Try different settings in the Hatch Edit dialog box and preview the results. If you use the HatchEdit Command (HE), you will see the HatchEdit dialog box that looks like the one used in the Hatch command. To see what "Hatch Association" is, pick on the rectangle (be careful not to select the hatch) and you'll see 4 squares appear on the corners. Click and drag one of the corners and release it. If your hatch is associative, it will update to the new shape. If you have ever done hand drafting, this feature will make you smile. HATCH TIPS: For monochrome printing: If you are using a solid hatch, make the hatch WHITE so that it will print out as a solid black, any other color could appear gray (with lines) when printed. If you have one hatch area drawn and want it to match the hatch of another, use the "Inherit Properties" button on the Hatch Edit dialog box. Try this by creating 2 different hatch styles in different objects. In recent versions of AutoCAD, you can add a 2 color gradient to an object. Draw another rectangle with a circle inside it. Type in GRA <ENTER> to start the Gradient command. This command works just like the Hatch command, but with different looking results. You can select the "T" option for settings or use the Ribbon to edit the gradient you just created. The HatchEdit (HE) command also works on Gradients. Below is a sample of a basic 2D 'rendering' using this method. See if you can recreate it using the Gradient command. You can create custom hatch patterns, or find custom ones available on the internet. Other websites offer some free ones as well as extensive collections for sale. Hatches can be exploded (X <ENTER>)- but be VERY careful if you do this. In fact, don't explode hatch patterns unless you really need to as you will get 100's of lines instead of 1 hatch. There is a setting in the Options dialog box under the drafting tab that allows you to turn on or off the ability to snap to hatch objects. Off is the default. Although the Boundary command does not create a fill of any kind, it works in the same manner as hatching so I am including it in this tutorial. Start by drawing four random lines in the pattern that is shown below. The length of the lines doesn't matter (for once). The goal of this exercise is to create a shape that matches the inside section of the four lines. This is a very simple example, but this tool can be very helpful when you need to create a complex shape quickly. This is quite straightforward, see the "Pick Points" button at the top, select it and then pick the area in the middle of your four lines and press enter. Depending upon your settings, it may look like nothing has happened. To see what you created, start the Move command and use the "L" option to select the last option your created and you'll see a new object be highlighted. You've just created a polyline - and these are covered in tutorial 2-7. Here is another command that can sometimes be quicker than a hatch. Solid allows you draw an solid filled object using 3 or 4 points. For this example, use the same four lines that you drew for the Boundary exercise..
Is that what you were expecting? I don't think so. This command works great when you only use 3 points. 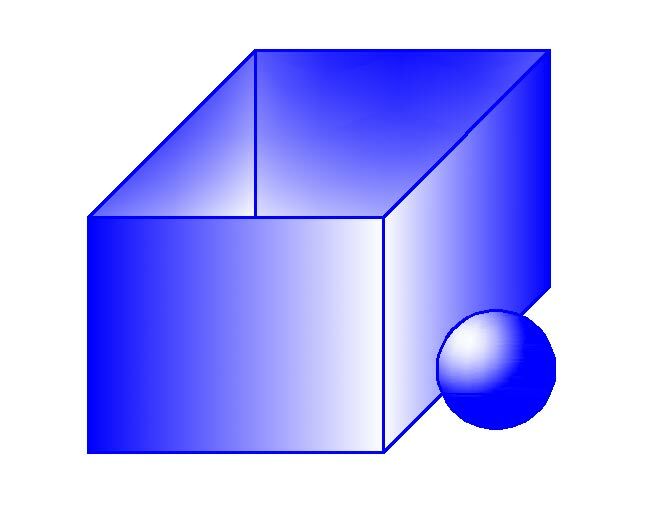 To fill this shape completely, you would need to draw two Solids using 3 points each, or just use the Hatch command. Extra Practice: Complete this drawing and copy the gradient hatches shown in this image. Extra Practice: Draw this shape and hatch each possible section. It could look something like this when it is done (check that you hatched all areas and the scale is correct. Bonus Practice: Here's a real world example to practice many of the skill that you have learned so far (including hatching). Duplicate this drawing from the National Forest Service. After showing you the power of blocks and attributes, I thought it would be good to slow down and show you a simpler tool. If you've already forgotten how blocks and attributes work, please go back and review those lessons.